Last week on the American Crafts Blog, the Design Team shared projects that could be created in under 30 minutes! Think it can't be done...well, let me tell you, it can! I kind of procrastinated on this one assignment, because it is a little daunting to think of creating a layout in 30 minutes. But once I formulated my plan, it came together quickly and easily! Before getting started, grab a photo and some supplies you want to work with, set a timer, and then get to work! 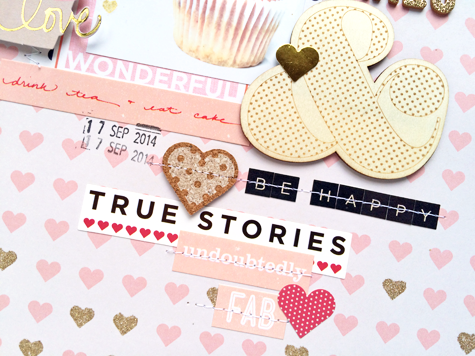 How to: Start out by choosing a patterned paper that does some of the work for you. I used the Ride patterned paper from the Shimelle collection, because the small heart pattern added some interest but wasn't an overwhelming pattern. Add some layers behind your photo using various patterned paper. Create a large title using a mix of the Letter Stickers, Fitzgerald Thickers, and a large wood veneer. Add some stickers to your layout from the Accent & Phrase Stickers pack. 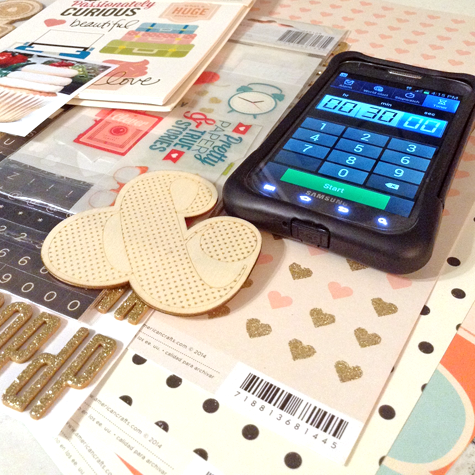 Finish your layout by adding some quick machine stitching. And here's one more tip, if you're still thinking it is impossible to create a layout in under 30 minutes...find a Sketch! Using a sketch, takes a lot of the guess work out of working out the design of your page. So take that 30 minutes, and get in your scrap area and create away!